That really bothered me for a few different reasons. First of all, it's totally unacceptable to ridicule anyone's religious beliefs. That should be the bare minimum of tolerance. Secondly, I'm tired of facile comparisons based on a superficial understanding of Buddhist theology, as well as ignorance of the actual concerns many Christians have about what is taught in mindfulness classes. Why is there such a persistent assumption that mindfulness teachers are all Buddhist? 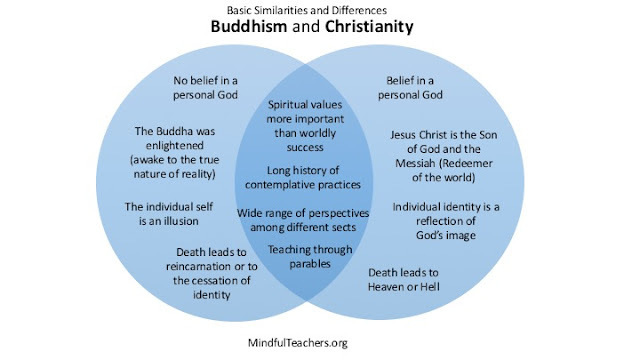 In fact, many Buddhists are bothered by the way traditional teachings have been secularized and taken out of context. And there are many Christian mindfulness teachers, as well as teachers who happen to be Christian but are reluctant to publicly discuss their beliefs. “I have children of all different faiths in my classes. I never mention religion, since I want my classes (and mindfulness) to be available to all. I feel the moment that I mention I am a Christian, people are wary since they are worried I will bring some religious instruction into the classes. For me, the two are different. Also, there are some Christians who are closed to mindfulness exercises because the person who created them wasn't Christian. 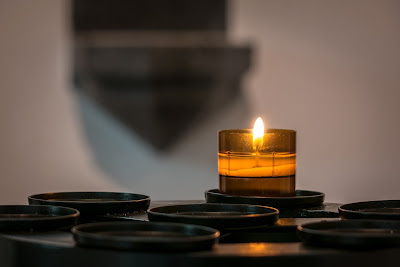 They will usually not be swayed by the fact that I am okay with it, and might even in some cases try to convince me that it is wrong [to teach mindfulness practices with non-Christian origins]. "Mindfulness isn't unChristian; in fact, practicing mindfulness can potentially make you a better Christian. You can bring your full attention to the Sunday sermon, or you can let your mind wander while you keep glancing at your phone. You can pray with your full mind and heart, or you can repeat phrases without really thinking about what you’re saying." Christian writer Gari Meacham cautions against this type of "repetitive and stale" prayer, "reciting the same things over and over with no heart connection." Oops! I probably said that prayer a thousand times in my youth and never even knew what I was saying!" "We don't have to know what it means. We just have to memorize it." Even for adults with the best of intentions, it can be challenging to focus on the meaning when we keep hearing the same words over and over and over again. Don't get me wrong. I really like the parables from both traditions. I just think it would be nice to expand the repertoire rather than repeating the same stories to the same audience. “Over whatever you have to do, even if it be urgent and require great care, I would not have you argue or be agitated. For rest assured, everything you do, be it great or small, is but one eighth of the problem, whereas to keep one’s state undisturbed even if thereby one should fail to accomplish the task, is the other seven-eighths. Do you agree or disagree that this advice to Buddhists could also be beneficial to Christians? That quotation is from St. Abba Dorotheus, one of the early Christian hermits referred to as the Desert Fathers. “The Desert Fathers, like present-day Indian yogis in the high Himalayas, sought out the isolation of the harshest desert to commune with God free of worldly distractions. The meditation practices and rules for living of these earliest Christian monks bear a strong similarity to those of their Hindu and Buddhist renunciate brethren several kingdoms to the east. While Jesus and his teachings were their inspiration, the meditative techniques they adopted for finding their God suggest either a borrowing from the East or spontaneous rediscovery. When we think we've heard it all before, it can be useful to be shaken up a bit by hearing unfamiliar perspectives from other traditions. Personally, I've become a fan of the Sufi character Mulla Nasrudin, who does things like sprinkling crumbs to keep the tigers away. Secular and Spiritual Perspectives on Gratitude includes Hindu and Humanist, as well as Christian, Buddhist, and Jewish points of view. I invite you to explore some new perspectives, and perhaps see your own tradition with fresh eyes. However, in drawing comparisons and encouraging a reflection on the potential value of unfamiliar teachings, I don't want to perpetuate the misunderstanding that ‘all religions are the same’ or ‘it doesn't matter what you believe’ (both of which can be offensive to people whose faith is central to their lives). I love that image, but I think we should be rummaging through the closets of other traditions as well. Some of what we find may require alterations, and some of it won't suit us at all. But we might be pleasantly surprised to find an accessory that coordinates with, and gives new life to, our favorite ensemble. And we can open our own closets to our neighbors and welcome them to share in our bounty. There's more than enough to go around. Can Evangelical Christians Practice Mindfulness?